Fr. Daniel Scheidt of Queen of Peace Parish in Mishawaka, IN, just signed on as chaplain for my pilgrimage to the Holy Land May 9-18. Those who know him will agree with me that Fr. 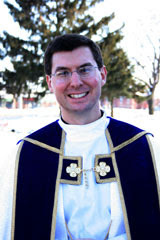 Dan is one of the finest young priests in the Diocese of Fort Wayne-South Bend, the diocese that includes the University of Notre Dame, my (and Brant's) alma mater. Fr. Dan is a scholar and a polymath who has studied at the John Paul II Institute in Washington, DC, and written on subjects such as diverse as biblical interpretation, sacraments, priesthood, and church architecture. In fact, one of his essays on church architecture is available online. Some of his pastoral work has made national catholic news. I feel very fortunate to get Fr. Dan on this pilgrimage (probably as good as Jack Swarbrick felt when he got Brian Kelly to come to Notre Dame). The pilgrims are in for a real blessing! The Bishops of the Holy Land ask all Christians to make pilgrimages to the Holy Land for the welfare of the Eastern Churches. I always wanted to do a pilgrimage to the Holy Land. Traveling is just too expensive for me right now. I hope I can finally get there and see those holy places someday.